Robert Ku was born in Korea, in the city of Incheon, the birthplace of jjajangmyeon and tangsuyuk, which just might be his death row meal. When he was eight his family moved to Hawai‘i, where he survived on plate lunches at Grace’s, Zip Pacs at Zippy’s, and saimin at McDonald’s. After high school he moved further east, to California, which he considers his Lost Years, having only lousy Seventh-Day Adventist vegetarian food (fake meat!) to eat for five years at his college dining hall. Then he was saved! No, not by the long haired guy who turned water into wine (although that’s a neat trick, if you ask him), but by moving to New York City, where he discovered falafels in Greenwich Village, beef and barley soup at the Kiev, xiaolongbao at Joe’s Shanghai, vindaloo at Jackson Diner (before it was ruined by the hipsters), doro wat at Meskerem, and kalbi at Kang Suh when they still used real charcoal in tabletop grills. Oh, and by some miracle he finished his Ph.D. in English at CUNY [City University of New York] and by a bigger miracle got his first academic job at Hunter College, where he directed the Asian American Studies Program for a couple of years. Then he moved back west briefly and chaired the Department of Ethnic Studies at Cal[ifornia] Poly[technic], San Luis Obispo, where he discovered his love of Central Coast Pinot and Dungeness crab, and for the first time realized what REAL strawberries tasted like. Which brings us to the present and the place he now calls home, Binghamton, New York, where he is an associate professor of Asian American studies at Binghamton University. Yes, Binghamton: if we were to be kind, we’d call it the birthplace of the spiedie (sigh). If we were blunt, we’d call it a culinary Waste Land. Sigh. But despite the bad food, or perhaps because of it, Binghamton is in his heart. After all, this is where he met his wife, where their twin boys were born, where he has a community of dear friends, and where he finished his two books: his co-edited (with Martin Manalansan and Anita Mannur) volume, Eating Asian America: A Food Studies Reader (New York University Press, 2013), and his monograph, Dubious Gastronomy: The Cultural Politics of Eating Asian in the USA (University of Hawai‘i Press, 2014). Oh, and there is also a Wegman’s there! Shantih shantih shantih. 2014 Criticism. Courtesy of the author. (This essay is adapted from Dubious Gastronomy: The Cultural Politics of Eating Asian in the USA, published in 2014 by the University of Hawai‘i Press. 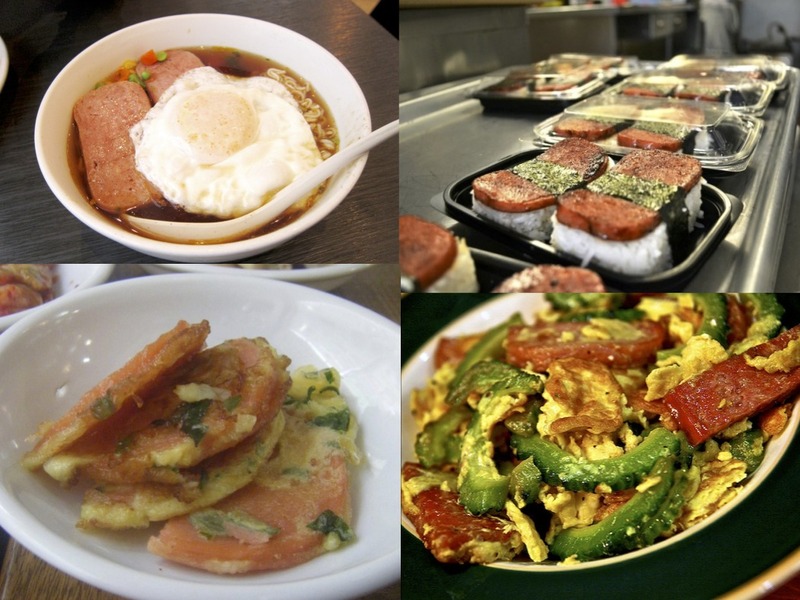 In her article “Spam I Am,” another Korean American, Sunyoung Lee, asserts that in the popular imagination, “this neatly tinned pink gelatinous substance straddles a gamut of associations from trashiness to status to kitsch.” But, as someone who grew up eating the stuff, there is a personal consideration for her as well: “Spam tastes good.” I could not agree with both Kim and Lee more. I also grew up with the stuff, and, despite the contradictory array of reputations that precedes it, I also find it delicious. Thus, I too am SPAM—and in more ways than one. I trace my roots to Korea, where I was born, and Hawai‘i, where I spent my formative years. Not so coincidentally, these two places top the list of the world’s biggest consumers of SPAM. According to one estimate, while Guam leads in terms of per capita, South Korea is the largest bulk consumer. That Hawai‘i ranks first among US states is well chronicled. Hawai‘i accounts for roughly eight percent of all domestic sales by a population that represents less than half of one percent of the total US population. No matter how you slice it, that’s is a whole lot of … what exactly? SPAM is one of America’s great dubious foods, one that is widely regarded as vulgar, tacky, and farcical. To its detractors, SPAM is less a comestible than a series of bothersome questions: What is it? Is it edible? Is it a joke? SPAM is the quintessential “mystery meat,” not found at your local butchers but in the netherworld of the industrial food complex. Many of my friends and colleagues find SPAM laughable. To be more precise, most of my non-Korean, non-Filipino, and those-not-from-Hawai‘i peers find it laughable. Everyone knows of SPAM, but who has actually tasted it? Who admits to actually liking it? More importantly, what does it mean to consider SPAM an inalienable part of one’s sense of self? While it exists mainly as an object of snooty condescension and a symbol of culinary unsophistication to most Americans, the product is held in much higher regard elsewhere in the world—namely in the Asia-Pacific world. But how did it get this way? 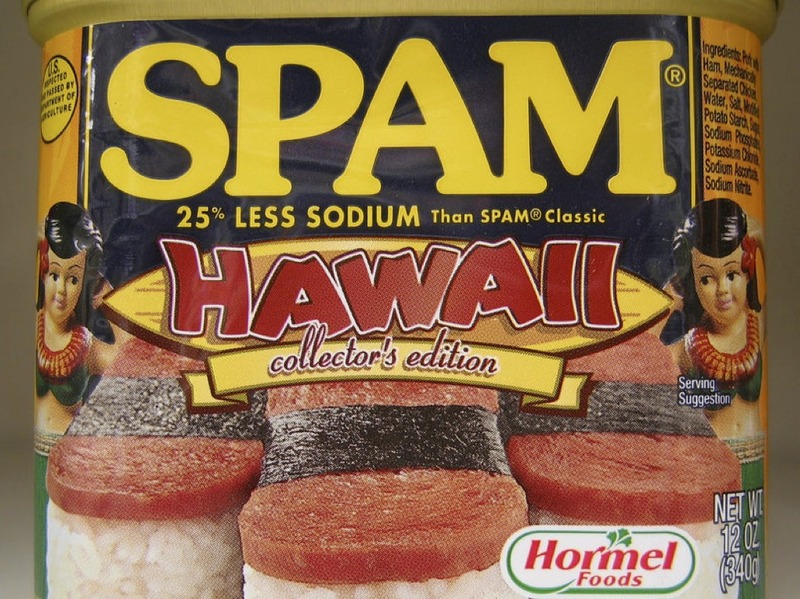 How is that SPAM, a punch line to a joke for most Americans, is a beloved comfort food in Hawai‘i and a status symbol in the Philippines and South Korea? For answers, we must reflect on the fact that, at its core, SPAM is a preserved food. Specifically, we must consider the role of food preservation—particularly the method of canning food—in the history of seafaring and the modern military. The age of industrialization and dramatic rise of Europe’s population during and after the eighteenth century coincided with improved food preservation methods of various sorts, from drying and smoking of fish to pickling of fruits and vegetables to canning of meats. The epic sea voyages giving rise to Europe’s age of discovery provided the entrepreneurial incentive needed for radical improvements in food preservation methods. As early as mid-eighteenth century, the Dutch navy subsisted on beef preserved in fat and stored in ironed canisters. The Dutch also established a salmon canning industry using a similar method. The British Royal Navy had by this time adopted a “portable soup” made from the offal, shins, and hooves of cattle. Stored as a thick, glue-like cake prior to being dissolved with boiling water to make an insipid broth, the soup was detested by most seamen but considered essential by the higher ups. Captain James Cook thought so highly of the soup that he took it along on all his voyages and flogged the men who refused to eat it. More so than any other European power, it was the French who revolutionized large-scale food preservation, and, in particular, the practice of thermal sterilization, which is the heating of foods in sealed, airtight containers, such as jars and cans. The individual credited for perfecting this technique is a French pastry chef named Nicolas Appert. 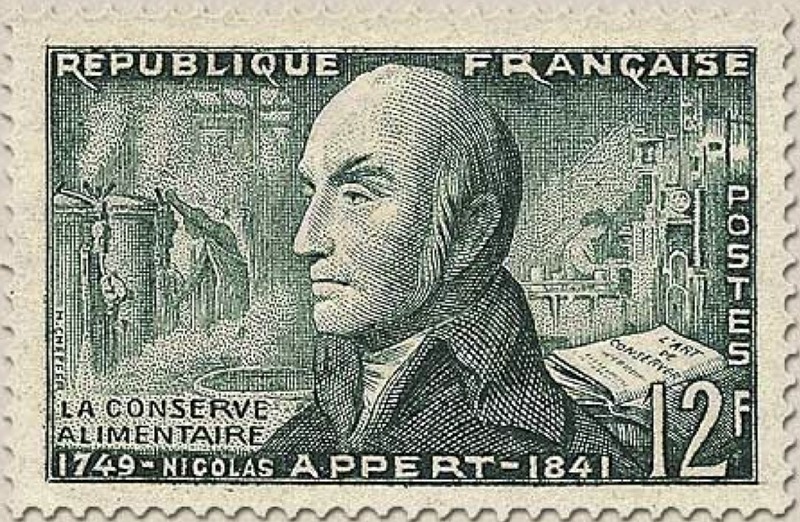 In 1804, eager to profit from his new technique, Appert set up a factory that employed fifty workers. Industrial scale canning of food had now officially begun. The method of canning meat that Appert put into practice at his factory in Massy, France, is essentially identical to that employed some two centuries later at the SPAM plant in Austin, Minnesota, aka “Spamtown,” which churns out nearly 150,000 cans of SPAM during a single daytime shift. In both instances, chunks of meat are placed into hermetically sealed cans, which are then heated. The French government in the meantime sought ways to improve the military diet. It did so with the understanding that, to quote the famous adage attributed to none other than Napoleon Bonaparte, “An army marches on its stomach.” Specifically, Napoleon sought food that was economical, transportable, tastier, and more nutritious than the dried, salted, and smoked products that the army had hitherto relied on. The canned food innovated by Appert turned out to be the answer. This form of provisions had several strategic advantages: It allowed rations to be prepared and stockpiled in advance, stored for long periods, and transported to combatants without the risk of spoiling. It also curtailed the difficulty of seasonal variations, allowing for military campaigns to be waged even in winter. Over the course of its history, the US military had also been keenly aware of the importance of a sound food policy. During the War of Independence, the American army drove live cattle and hogs to campsites in order to provide soldiers with fresh meat, an arduous practice that lasted until the Spanish-American War of 1898. This sort of reliance on fresh food had serious drawbacks, however: For every soldier killed in battle during the Spanish-American War, fourteen died of an illness link to either a lack or spoilage of food. This prompted the army to revise its food policies in 1901, and thus was established the different categories of military ration, such as garrison, field, and emergency—aka A, B, C, D, and K rations. In 1935, perhaps in anticipation of the US involvement in World War II, a government directive mobilized all branches of food science to improve the quality of the existing combat ration. Specifically, the directive sought to stimulate production of an emergency ration that (a) would be usable under any climactic conditions, (b) would deliver the highest number of calories in the smallest package possible, and (c) would be palatable enough to eat every day. With the American entry into the war following the attack on Pearl Harbor, the efficacy of the American military’s scientifically formulated ration would be thoroughly tested. It would pass with flying colors. Both the allies and enemies of the US were awestruck by the quality, quantity, and variety of food the American had at their disposal. The British soldiers, who took pride at “making do” with limited provisions during wars and other difficult times, saw the Americans as “overfed.” So did the Germans. Never in the history of mankind had an army been as abundantly supplied with food as the Americans. For example, in 1942, an average American civilian male consumed 125 pounds of meat. The average soldier consumed 360 pounds. 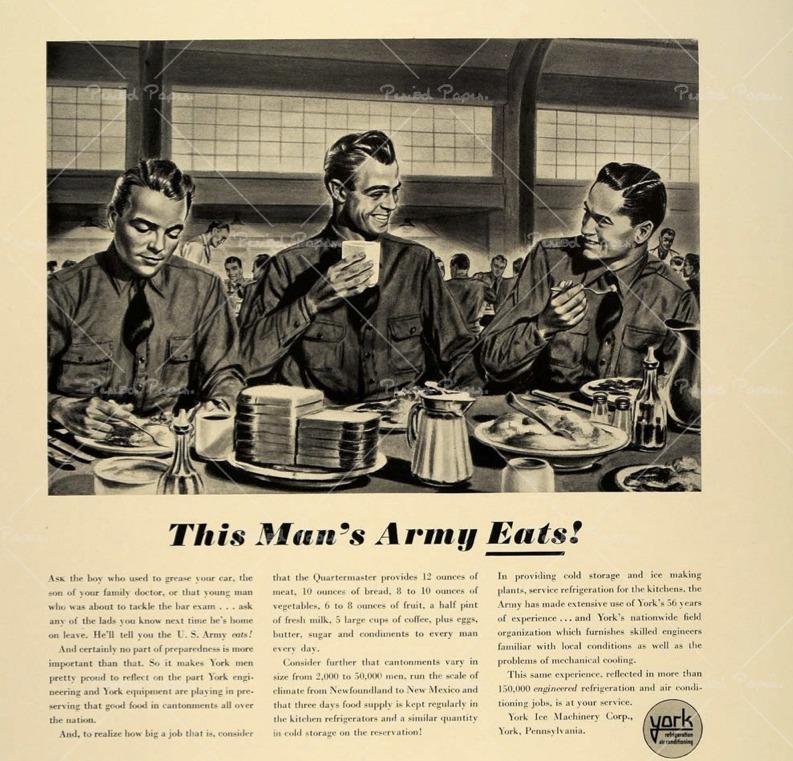 Military chow provided far more than the minimum calories and nutrients the soldiers required. Despite their incessant complaints about the awful and repetitive taste, the GIs thrived on it. Most World War II recruits had hailed from humble if not impoverished backgrounds and, like the US population at large during the Great Depression, was typically malnourished. For many soldiers, therefore, army grub was literally the best they ever had on a regular basis. For instance, it was not uncommon for men stationed at the Air Force base in Randolph Field, Texas, to gain ten to twenty pounds each month. Accompanied by mobile field kitchens, the GIs ate remarkable well even near the field of battle. Instructed to provide their comrades with at least one hot meal each day, army cooks baked fresh bread daily on portable ovens and served it alongside hot soup and stew filled with meat. Ice cream machines were a standard issue—a godsend for those stationed in the sweltering South Pacific. And for those directly engaged in combat, there were the emergency rations, the bulk of which would not have been possible had it not been for Appert’s contribution to the Napoleonic Wars. Each element of the rations was in one way or another preserved, with canned meats and vegetables playing the starring role. For example, the K ration was packed in three separate boxes, each a complete meal containing canned meats and vegetables, beans and stews, hash, coffee tablets, concentrated bouillon, powdered lemon juice, biscuits, chocolate bar, and chewing gum. As part of the nation’s austerity measures, the government established a strict rationing system among the civilian population, which at times prompted hoarding frenzies. A year after the attack on Pearl Harbor, it was common for entire sections of grocery stores shelves to remain bare. Citizens on the home front could no longer indiscriminately consume such commonplace items as gasoline, coal, tires, sugar, coffee, canned foods, and medicine. For the most part, Americans tolerated the shortage with stoic patriotism. What appeared to perturb the people most, however, was the rationing of fresh meat. In various parts of the country, the police were called to quell angry mobs at butcher shops and other outlets where meat was sold. It was during this period that the Hormel company, and its signature product SPAM, came to national prominence. Faced with a shortage of fresh meat, the civilian population turned to canned meats in droves. Sales of SPAM, which was first launched in 1937, doubled between 1939 and 1942. By 1944, Hormel exported some ninety percent of all its products overseas, including to Britain, where SPAM became a huge hit. Faced with austerity measures far more severe than the Americans’, the British took to SPAM fervently. It was included in sandwiches, fritters, and rarebits, and was baked clove-studded and glazed with brown sugar, mustard, and vinegar. Considered a luxury, SPAM was highly coveted during and for many years after the war. This, however, did not stop SPAM from eventually ending up a target of mockery, best fitted for British satirists like Monty Python. 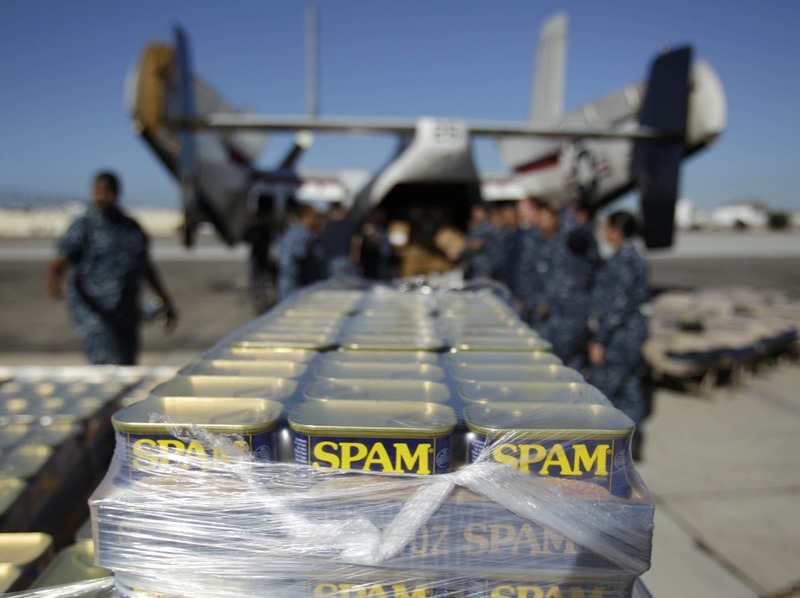 As World War II drew to a close, SPAM found a home also in Asia and the Pacific, particularly in countries that played a major role in US military endeavors. Since 1898, when the American military first fought a significant battle in Asia against the Spanish in the Philippines, the Asia-Pacific region has served as the backdrop for the majority of major US combat operations. Following the heels of the Spanish-American War was the Philippine-American War fought on Filipino soil. When the US declared war against Japan after Pearl Harbor, the entirety of the Pacific Rim and almost every Pacific island turned into a single, enormous theater of war. During the Korean War, some 37,000 US soldiers died fighting in Korea, and an additional 58,000 perished in the jungles of Southeast Asia during the Vietnam War. In most cases, the end of US combat operations did not mean the exit of US military personnel from the region. Rather, it often meant prolonged military occupation or even permanent American presence with the establishment of bases and camps in such strategic locations as the Philippines, Okinawa, Japan, Korea, Guam, and Hawai‘i. The current culinary significance of SPAM to the cuisines of these places is thus directly linked to the modern history the US military. 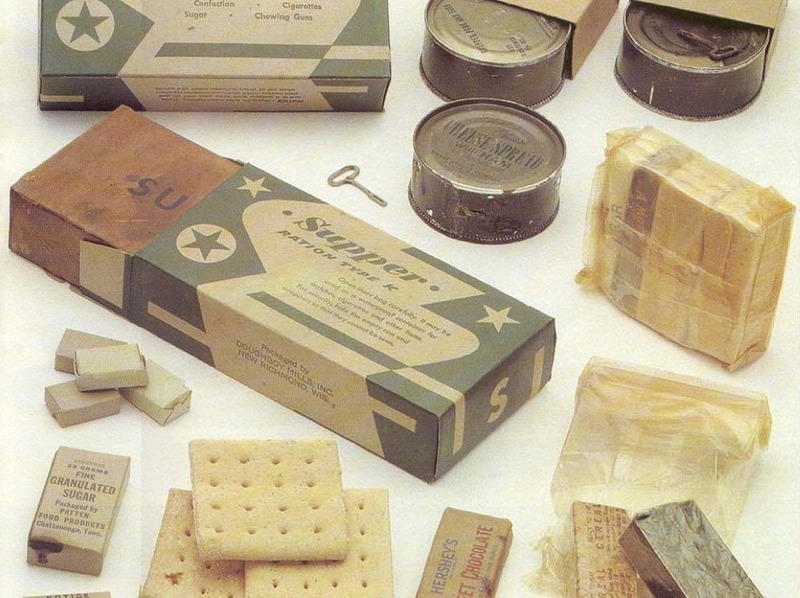 What started out as emergency rations for American GIs during the war eventually morphed into a symbol of American generosity and superiority to Asian and Pacific natives during the postwar years. 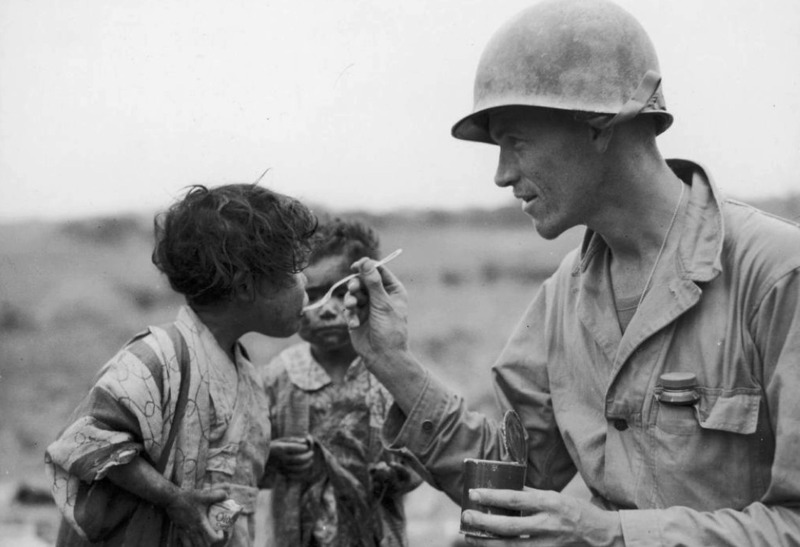 Lewis posits that the “successes of the Allied military effort in the Pacific theater during World War II gave an intense and up-close introduction to many Pacific cultures of things American.” This includes such items as beer, chocolate, chewing gum, and military rations, like SPAM, which “became valuable artifacts of the most recent occupying culture, and prized as such by the locals.” And despite feelings of ambivalence or resentment the natives might have toward the US military, SPAM remains a local favorite. 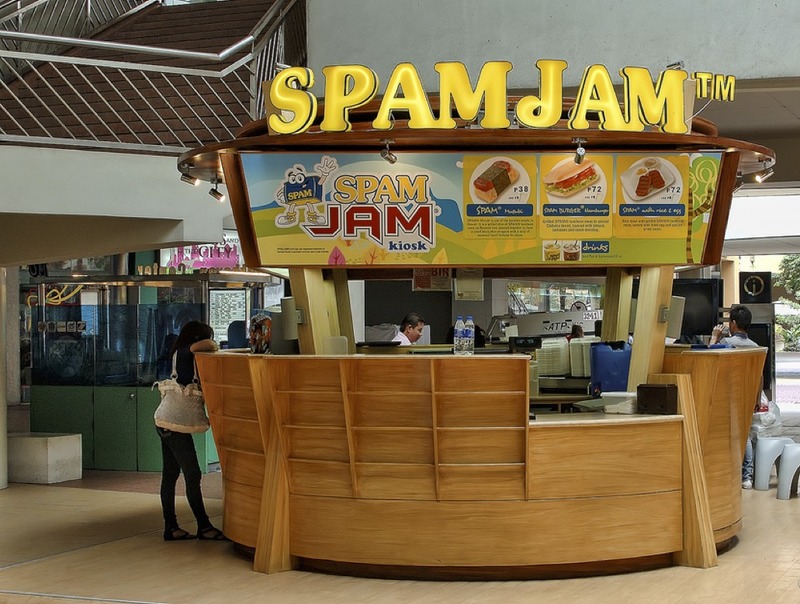 And unlike in Britain, where the product fell out of favor among the people within a generation, SPAM has not lost any of its luster for many Asia Pacific peoples, including those who live in the US. 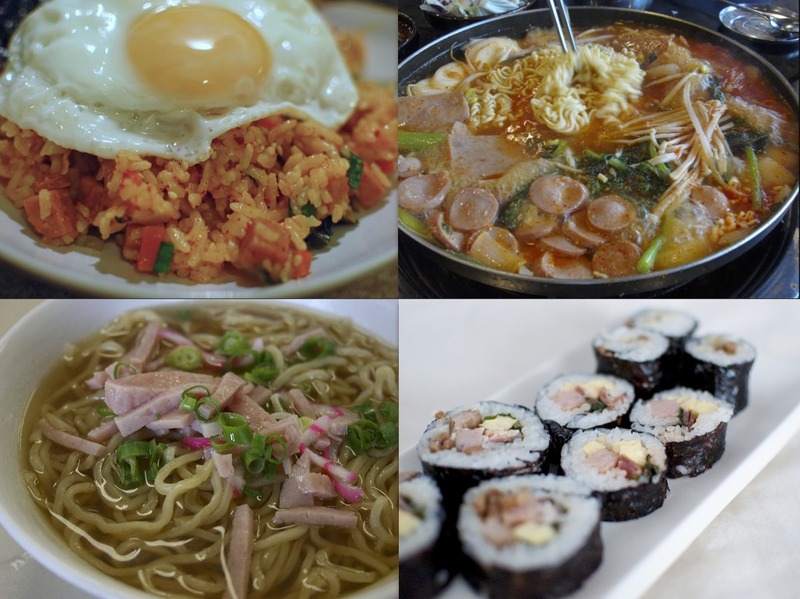 It is for these reasons that SPAM is not a joke to the devoted legions of Koreans, Filipinos, Pacific Islanders, and Asian Americans, especially those of Korean, Filipino, or Japanese ancestry. SPAM is a part of who they are. It is no less integral to their identity than, say, Jamón serrano is to some Spaniards, Proscuitto di Parma to Italians, haggis to Scots, or their respective visage of the hot dog to New Yorkers and Chicagoans. With every bite of SPAM, layers of overlapping histories, crisscrossing migrations, and elaborate cultural transformations are consumed. With it are consumed calamitous political turmoil, military conflicts, and other global upheavals that shaped much of the twentieth century. Those of us who love SPAM do so not despite but precisely because of what it is. That is to say, SPAM is not a substitute for something else shamefully consumed during moments of desperation but the real thing consumed in order to experience moments of gustatory pleasure. SPAM is not a metaphor—for, say, real meat. Rather, it is what it is. Ridiculous as it may sound, SPAM and I go together like Thanksgiving and pumpkin pie. And in this, I am not alone. Vast swaths of Asia, the Pacific, and Asian America sit alongside me at the table. Kim, Sylvie. 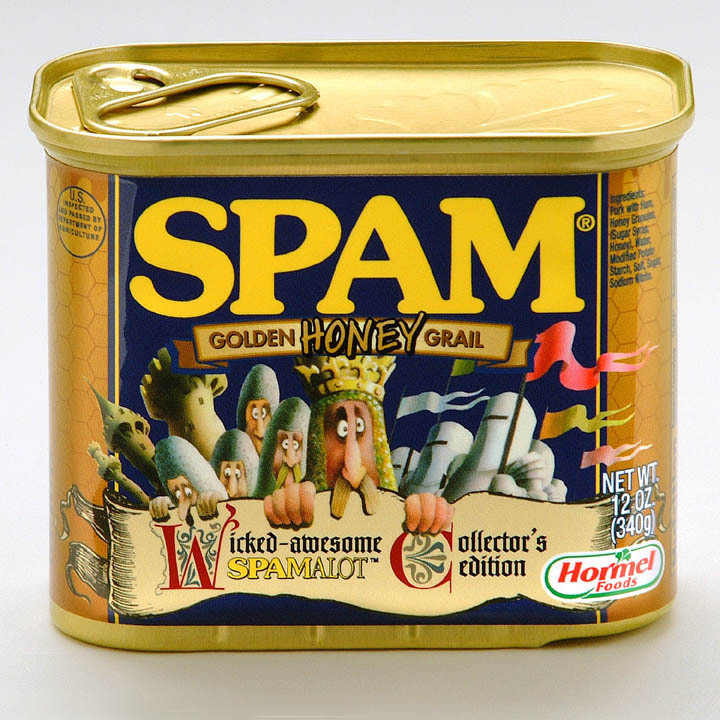 “The End of Spam Shame: On Class, Colonialism, and Canned Meat.” Hyphen (blog), June 3, 2011, http://www.hyphenmagazine.com/blog/archive/2011/06/end-spam-shame-class-colonialism-and-canned-meat. Laudan, Rachel. The Food of Paradise: Exploring Hawaii’s Culinary Heritage. Honolulu: University of Hawi‘i Press, 1996. Lee, Sunyoung. “Spam I Am.” MUAE 2 (1997): 78-83. Levenstein, Harvey. Paradox of Plenty: A Social History of Eating in Modern America. New York: Oxford University Press, 1993. Lewis, George H. “From Minnesota Fat to Seoul Food: Spam in America and the Pacific Rim.” Journal of Popular Culture 34.2 (Fall 2000): 83-105. Matejowsky, Ty. “SPAM and Fast-food ‘Glocalization’ in the Philippines,” Food, Culture, Society 10.1 (2007): 23-41.